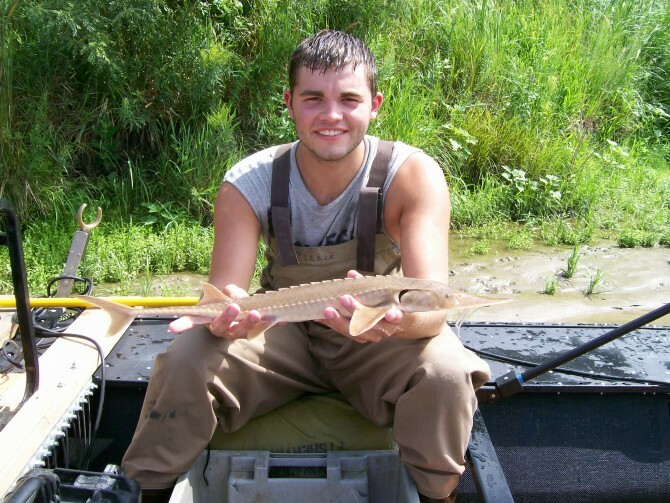 The work of graduate student Landon Pierce, of Lincoln, Neb., moves from rolling hills and pine tree habitat of the swift fox underwater as he studies the American paddlefish. The billed fish can grow over five feet long and weigh more than 60 pounds in Missouri River reservoir, Lake Francis Case. Paddlefish native to the Missouri River have declined since dams were built in the 1950s. Lake Francis Case has been stocked with fish since the 1970s. Pierce, SDSU professor Brian Graeb and South Dakota Department of Game, Fish and Parks biologist Jason Sorensen have almost completed the second year of sampling in the three-year SDGFP-funded population assessment of paddlefish. So far, Pierce has sampled over 280 paddlefish. He even caught and released one that would have broken the current state record. It weighed in at 140 pounds and is likely over 45 years old. “By examining fish age, recruitment, growth and mortality rates, we can assess the current status of the paddlefish in Lake Francis Case and determine if stocking has worked,” said Pierce. The team is collaborating with the Nebraska Game and Parks Commission and the University of Nebraska-Lincoln as they conduct research downstream in Lewis and Clark Lake. The U.S. Fish and Wildlife Service also partners in the project.